The Horny Funk Brothers, eine 9-köpfige Truppe, die sich mit Leib und Seele der Soul-Funk-Tradition der 60er- und 70er-Jahre verschrieben hat, stehen für jede Menge raffinierte Melodien, samtigen, energiegeladenen und schweißtreibenden Soul und pulsierenden Groove, kurzum – für jede Menge guter Musik und Spaß auf und vor der Bühne. 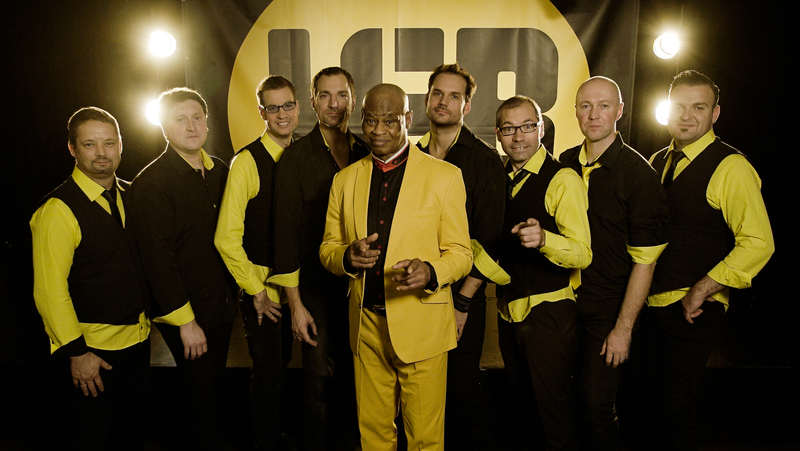 Präsentiert wird die Creme de la Creme der Soul & Funk Ära mit Leadsänger Hubert Tubbs (ex “Tower of Power”). Abwechslungsreich, virtuos und voller Energie – diese Musik macht Spaß, packt den Zuhörer, animiert Kopf und Bauch und fährt in die Beine. Within only a few months the HFB became the guiding star for all the fans of Funk’n’Soul. But not just all funkateers are totally amazed by the band’s extraordinary performance. Those phat grooves and pumping rhythms make everybody shake a leg. The perfectly choreographed show combined with the outstanding voice of Hubert Tubbs (ex “Tower Of Power”) provide the concert experience of a lifetime for everybody! An incredibly tight performing 5 (five!) piece horn-section in addition to the hottest rhythm-section you’ve ever heard plus Hubert Tubbs’ lead vocals mean nothing less than awesome, breathtaking, pure entertainment you’ll never forget. Hubert began singing at the age of six. His musical career started with appearances in gospel choirs and later he formed his own band while also working with a great number of successful international acts. After performing with some of the most successful people in the music business, he finally caught the attention of the internationally renowned band “Tower Of Power” and became their lead singer. During his intensive work with TOP Hubert recorded two albums: ‘In The Slot’ and ‘Live And In Living Colour’, both distributed by Warner Brothers. Besides TOP, Hubert Tubbs has also worked with artists such as The Rolling Stones, Quincy Jones, Santana, Elvin Bishop, Rod Stewart, The Grateful Dead and Bob Dylan, just to mention a few. Our saxophone player is one of the founding members of HFB. Lorenz studied his craft at the university in Vienna and he is proving his skills not only as an instrumentalist but also as an arranger, supplying the band with new material. Among others, he has worked with Eric Papilaya, Betty Semper, Big John Whitfield, Peter Legat (Count Basic), Roman Gregory, Birgit Denk, Tyrone Davis, Johnny Logan, Roberto Blanco, Limahl, Wolfgang Lindner Band, David Hasselhoff, Tanzorchester Cremisa, Marc Pircher, Rats are back, Perfect, Peter Cox and many more. Our man from Lower Austria started playing the saxophone at the age of eight. For the first ten years he was taught by G.Hagauer, later by Prof.Quarda at the Jazz Conservatory, Vienna. In 1997 he joined the military orchestra in Vienna and since 2000 he is musical director of the “Gardemusik Big Band”. touring in countries such as Japan, Russia, Belgium, Turkey, Italy and Germany. “Funk is a way of life, not just a style of music”. He is one of the founders of the band and is the man for high notes and those amazing solos. He learned his craft at the Conservatoire in Vienna and his musical activities range from small ensembles to big bands such as Blue Danube Big Band, Helmut Lotti, Cremisa, Andy Lee Lang and The Lower Austrian Big Band. “More than two decades ago I beheld the light of the earth. After many years of ‘instrumental uncertainty’ I finally found my passion: the trombone and all styles of jazz”. Hoffi was one of the founding members in 1999. After studying at the Vienna Jazz Conservatoire he has gained experience in various projects such as Blue Danube Orchestra, Lower Austrian Big Band, The Original Brothers as well as working as a successful recording musician in recording studios up and down the country. Thomas aka Hechi studied guitar with Christian Havel and he is not just a great guitarist, but also an accomplished arranger and composer. Hechi penned countless songs, including many for for the new HFB album. On stage and in the studio the Tyrolean has worked with Vanessa Haynes (Incognito), Waldeck, Christina Stürmer, Christian Kolonovits, Big John, Carl Avory, Boris Bukowski, Coup de Bam, 5 in Love, Erwin Kiennast, Josh, Kurt Ostbahn, Camo and Krooked, Olly Murs, Mat Bianco, Karin Kienberger, Andy Lee Lang, Adi Hirschal, Alexander Göbel, as well as many theater and musical productions (Burgtheater Vienna, Volksoper Vienna). Funk und Soul is his great passion! The first time (and certainly not the last) he gained the public’s attention was when he performed a children’s song on his first organ in the nursery. The organ still exists and is awaiting a place in the Rock&Roll museum of Waidhofen. Rafael Ecker aka “Joffy” got a more professional approach to music when he got tuition at the Bruckner Conservatory in Linz and later when he attended the University Of Music And Performing Arts in Vienna were he was taught by Hepi Kohlich and Dieter Kolbeck (Count Basic). Joffy worked with artists and bands such as Doretta Carter, Wolfgang Ambros, Inés Reiger, Erik Trauner, Joesi Prokopez, Ursula Slawicek, Men In Black & The Lady In Red as well as Kaga. Originally he wanted to become a NBA Basketball pro, but bands like Incognito, Jamiroquai and Tower Of Power changed his mind. He achieved a Diploma on the Gustav Mahler Conservatory, taught by Volker Wadauer. No matter if 4, 5 or 6 strings, groove is guaranteed! Rue performed with A-HA, Gloria Gaynor, Christina Stürmer, Waldeck, Saint Privat, Hallucination Company, Andi Baum, Dennis Jale, Valerie, Sandra Pires, Marc Pircher, Gilbert, Stella Jones, Willi Resetarits, Marianne Mendt, Hans Theessink, David Charvet, Joy Malcolm (Incognito, Ramazzotti), Dorretta Carter, Eric Papilaya, Andrew Young, Maya Hakvoort, Lana Gordon, Mat Schuh, Günter Mokesch, Roman Gregory, Monika Ballwein and Nina Proll. By the age of four, Christian built his first drum kit out of plastic bins. When he was 11 he was already playing in his first band, together with his brother. He studied Jazz drums at the conservatory in Vienna where he was taught by Prof. Walter Grassmann and Prof. Mag. Harald Demer. Amongst others he performs with Vereinigten Buehnen Wien, Dorretta Carter, Morpheus, Wolfgang Seligo Quartet, The Bricks, Manuel Ortega, Ungebleicht, Reinhard Theiser, Electric Ladyland, Ivoks, Erwin Bross and many others. Copyright HFB 2018. All rights reserved.